Maria Anguiano currently serves as CFO for the Minerva Project. Prior to her work at Minerva Project, she served as Vice Chancellor, Planning & Budget at UC Riverside. There she managed an $800 million budget and oversaw campus-wide strategic planning, financial planning and analysis, institutional research and capital asset strategies. During her three years at UCR she most notably led the redesign of the campus budget model, successfully negotiated the campus’ first design-build contract for a major research facility, guided a Physical Master Plan Study, and contributed to their organizational excellence efforts. Prior to this, she worked at UC Office of the President on financial and strategic system-wide initiatives to improve operational efficiency. Ms. Anguiano has also served as a senior advisor to the Bill and Melinda Gates Foundation's Postsecondary Success Team. Prior to this work, Ms. Anguiano worked at Barclays Capital in public finance investment banking and at Deloitte & Touche in corporate and nonprofit auditing and financial statement analysis. She currently serves on the James Irvine Foundation. 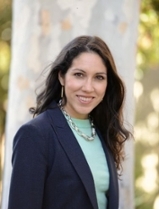 Ms. Anguiano holds an MBA from the Stanford Graduate School of Business and a BA in Economics-Accounting and Spanish from Claremont McKenna College. She is a first generation college graduate. Ms. Anguiano was appointed as a Regent in June 2017 by Governor Brown to a term expiring in 2028.